The S&P 500 averaged an annual return of 12 percent under a Republican president and split Congress, data show. "Markets typically like gridlock in D.C.," says Joseph Song, U.S. economist at Bank of America Merrill Lynch. 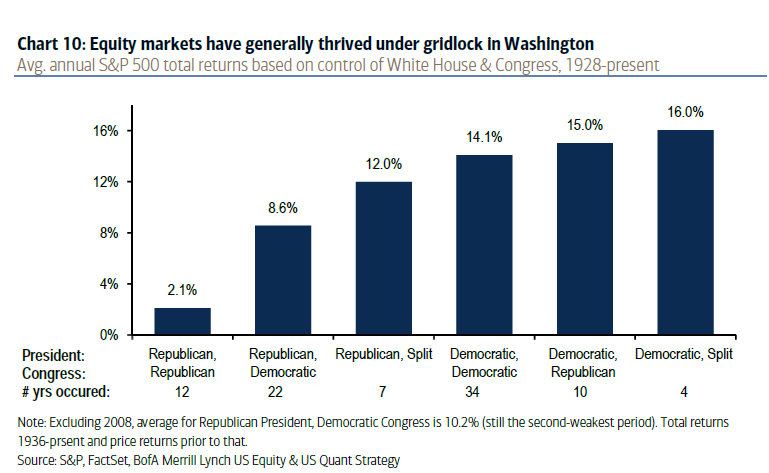 The best stock market returns occur when Washington, D.C., is locked in the "gridlock" that comes with different parties controlling the two houses of Congress, data shows. The best S&P 500 returns under a Republican president occurred while Congress was split, with that scenario producing 12 percent annual returns, according to data from Bank of America Merrill Lynch. "Markets typically like gridlock in D.C.," Joseph Song, U.S. economist at Bank of America Merrill Lynch, said in a note. This outcome may "modestly reduce risk of trade tension, and be supportive of risk assets." Song also said the industrials and materials sectors could benefit from a divided government as both parties could find common ground on a "small" infrastructure bill.